Today we’re eating herb-roasted chicken with fresh local mustard greens seasoned with pickled pork, fruit salad, and herb cheddar buttermilk biscuits. T: Let me start off by saying, dems was some good biscuits. A: Thank you mr. Tyler. I do believe I enjoyed them biscuits myself. T: Some of the best biscuits I’ve had in my 24 years. T: They were soft, moist, cheesy, and delightfully herby. A: I definately enjoyed the herbyness of them and the cheesiness. Everybody knows I’m a fool for cheese. T: anybody who isn’t a fool for cheese is just a fool. T: so, moving on to the chicken. You always hook up the roasted chicken. It was moist, tender, and just plain delicious. A: thank you again. I have to say that I’m not white meat’s biggest fan, but DAMN this was some moist tender breast action I ate today. T: As usual Dad’s greens were superb. A: not to mention his homemade, fresh pepper vinegar. T: awe I forgot to use some. T: now let’s talk about the fruit that we have pictured here. A: I have to say that the picture is a lot better than the fruit actually was. I got all this fruit obviously out of season at Walmart. The blueberries were so tart I couldn’t eat them. T: I believe Ghee said they were so tart they turned your mouth inside out. A: and Ghee was very much right. They certainly did. T: as for ratings… This was a great country meal. I would imagine it was better than our country ancestors had. A: not necessarily the case… our ancestors could hook it up, too, man. All their ingredients were fresh… of course, it could have been really bad. T: yeah, I guess there’s no way of knowing. I rate this meal a 9.1/10. A: and I give this meal an 8.7/10. T: I feel like we eat like royalty. A: We at least eat like royalty of old. T: Folks have done worse. A: that’s the truth. Folks have done a lot worse than this. Hay que beber y ser feliz. Thanks Denise! berries are definately some of my favorite fruit (along with peaches) You’ve a great website, all the desserts look so sinfully delightful!. 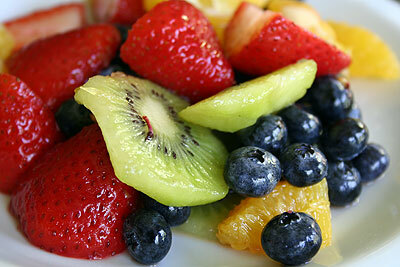 I was wondering if I could use your picture of the fruit salad on my site. I’m adding a new page for strawberry salads and am in need of some great pictures.